Any fiber arts lover knows the call of the yarn aisle. Given that it’s nearly impossible to pass up those beautiful skeins, it’s important to find a way to know just what you have in your stash! 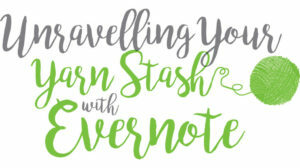 In this class you will learn how to quickly inventory your yarn stash with photos and details in Evernote.. for free! Your yarn stash will be searchable and available to you, no matter where you are thanks to the magic of their mobile app. Never again will you be questioning just what shade and dye lot you needed to complete the project you have on your needles. Not only will you save time (to spend on your next project! ), you’ll also save money (to spend growing your stash!). Join this class today and we’ll have your yarn stash organized in no time! If you’re not familiar, Skillshare is an online learning community with thousands of classes on everything from business to graphic design to fashion – it’s the Netflix of learning. I’ve learned a lot from the courses I’ve joined on Skillshare and I’m excited to become a teacher there. By using my special link below not only will you be able to enroll in my class, but you’ll also gain access to all other classes on Skillshare for just 99 cents! For three months, you can join any classes that you are interested in, all for less than a dollar. Click here to start unravelling your yarn stash today!